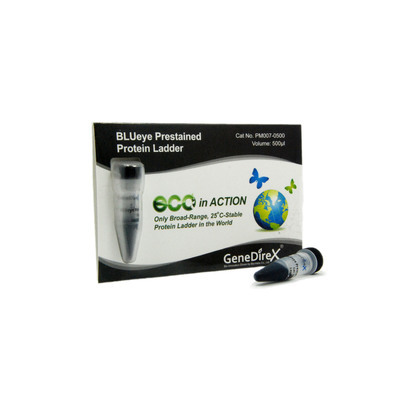 BLUEYE PRESTAINED PROTEIN LADDER, 500 UL. 3 μl or 5 μl per loading for clear visualization during electrophoresis on 15-well or 10-well mini-gel, respectively. 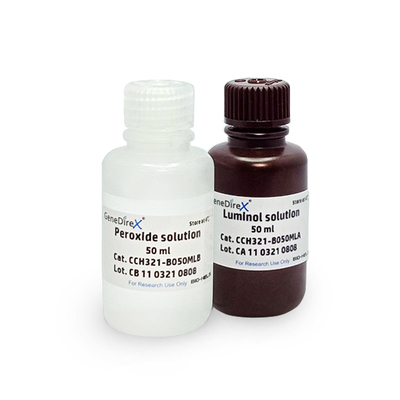 1.5~2.5 μl per well for general Western transferring. Apply more for thicker (> 1.5 mm) or larger gel. The BLUeye Prestained Protein Ladder is a three-color protein standard with 12 pre-stained proteins covering a wide range molecular weights from 10 to 245 kDa. 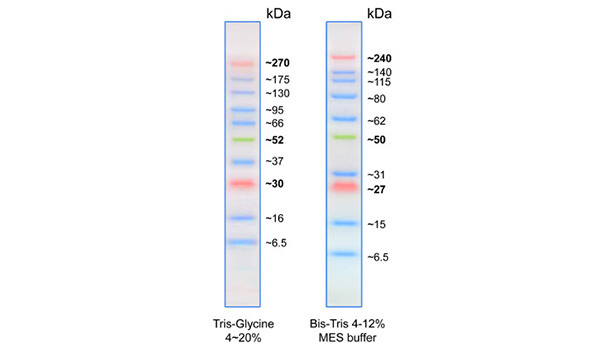 Proteins are covalently coupled with a blue chromophore except for two reference bands (one green and one red band at 25 kDa and 75 kDa respectively) when separated on SDS-PAGE (Tris-glycine buffer).The BLUeye Prestained Protein Ladder is designed for monitoring protein separation during SDS-polyacrylamide gel electrophoresis, verification of Western transfer efficiency on membranes (PVDF, nylon, or nitrocellulose) and for approximating the size of proteins. The ladder is supplied in gel loading buffer and is ready to use. Approximately 0.1~0.4 mg/ml of each protein in the buffer (20 mM Trisphosphate, pH 7.5 at 25°C), 2 % SDS, 0.2 mM Dithiothreitol, 3.6 M Urea, and 15 % (v/v) Glycerol). 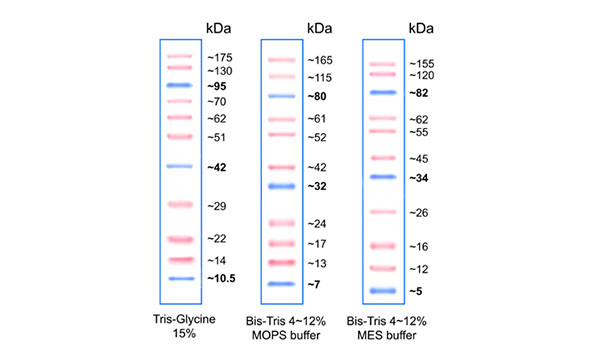 Under suggested conditions, BLUeye Prestained Protein Ladder resolves 12 major bands in 15% SDS-PAGE (Tris-glycine buffer) and after Western blotting to nitrocellulose membrane. Stable for up to 3 months at 4°C. For long term storage, store at -20°C. BLUTRA PRESTAINED PROTEIN LADDER, 1x500 UL. 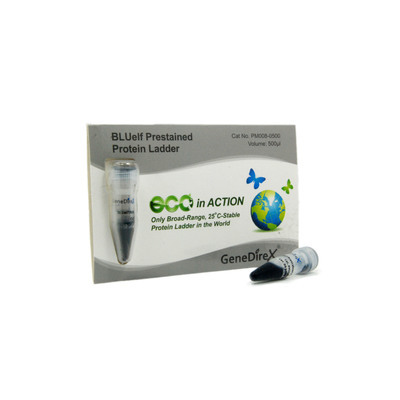 Bluelf PRESTAINED PROTEIN LADDER, 500 UL. PiNK PLUS PRESTAINED PROTEIN LADDER, 2x250 UL. NIMBLE JUICE SPEEDY PROTEIN GEL STAIN, 10 ML.